control. 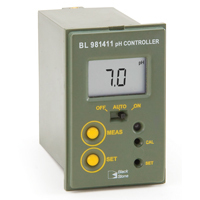 The unit is provided with differential pH input and can be used with any pH electrode with standard BNC connector. Measurements are clearly displayed on the large LCD, while the status LED indicates operating mode. than the set point. If the basic dosing is selected, the relay is activated when the reading falls below the set point. when the relay is active too long, to help prevent overdosing. Two models are available, with power supply input at 115/230 Vac or 12 Vdc. The BL 981411 is supplied with mounting brackets, transparent cover and instructions.